p>Click here to download the full article as a PDF. In December I intend to write a retrospective view of what we have achieved so far. Very tangible evidence of what we set out to do and what we are achieving can be seen in the lives of some of our secondary students, many of whom have been with us since they came into the nursery classes. Our journey is long and challenging, with many obstacles, disappointments but equally some heartwarming success. Secondary education in Rwanda is mixed. The majority of students go to boarding schools. This excludes all poor children who do not have external support. There is an increasing number of places in local secondary schools, but there is a charge and the students must achieve a certain academic level to be allowed to continue beyond Primary 6, so not all children can access this provision. Obviously not all the children who start in our nursery – between 60 and 70 each year – can be supported on through their school life, and some can manage on their own with support of their families. For us though, tough decisions have to be made about how much we can do. Those of our children who are fortunate enough to have sponsors who agree to continue their sponsorship into secondary school will go to boarding school if they achieve a high enough mark in the National Examinations. This is good for them in so many ways, not least having regular food, a bed to themselves and a place to study. In January the first group of our students who left us in 2014 to progress to secondary will go into Senior 3. This will complete the first stage of their secondary education and they will be thinking of options for further study towards the end of this next year. Here is the first group to leave us for secondary school, taken on our Primary Day on 31st of October 2013. They come back to see us the moment they are home from school, with many stories to tell, some of which I would like to share with you here. When I speak of ‘boarding school’ all of us will have an idea in our heads about what that is like, given the experience we have. I think the image most prominent would be of privilege, comfort and lots of extra opportunities. Here is a typical day for our students, as recounted by a couple of the boys. I wake up at 5 a.m. The students wash all their own clothes and bedding at the weekend. They are not allowed off the premises and parents visit on open days on the first Sunday of each month. These open days are used for meetings when parents are informed of school matters. Parents can buy drinks and cakes for the children. 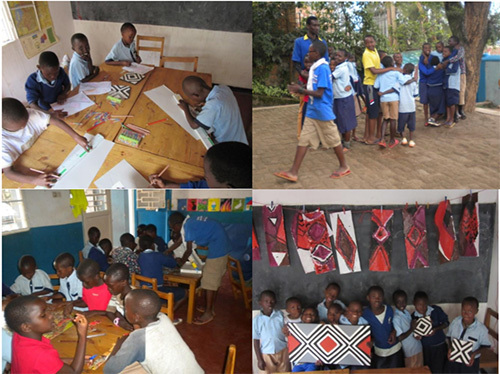 This is the second group, taken in October 16th 2014 and in January 2015 with some of the things they need for school. Each school has a list of what the children must supply – mattress, sheets and blanket, soap, bucket for washing, lockable box to hopefully keep belongings safe, a very specific list of how many notebooks of which size, pens of a particular colour etc. All of this is checked on arrival and uniforms are given out. Each item has a number as everyone is dressed exactly the same – few personal things are allowed. The children sleep in large dormitories in bunk-beds; parents are not allowed access to the rooms. Discipline is strict with rules being rigorously enforced. Negative remarks for discipline can result in expulsion or children made to repeat the year. Low marks will also mean the children are asked to repeat or leave. Most children manage being away from home well. Going to boarding school is normal for those who can afford it. For the poor that we serve it would be beyond their widest hopes without sponsorship support. The children enjoy the family visits and I went to see them in March. The children looked fit and well when we visited; they seem to be growing up very quickly. Our friend Wilma went to see some of them in September. It is a good thing that most of them are together in the same school. For the previous 7 years we have been very lucky to have Vincent with us to run a holiday school for the Primary children. This has become a very important event in our calendar, helping the children especially with their social but also with their English and Art skills. It is also a lot of fun for the children who do not have access to the games and materials we can provide for them to enjoy. The children and staff have loved what they have learnt with Vincent who is now working in California and who is very much missed. However, our older boys are very experienced with the club, having first attended as participants but for the last two years as Vincent’s assistants. This is part of our overall strategy to enable the community to take control and do things for themselves. And so, Vincent, you will be proud to know that we have run a club without you and very successfully! Onwards and upwards! – I hope you have enjoyed our news – I wish you love, luck and happiness in your lives. Thank you so much for supporting us, we can do nothing without you.